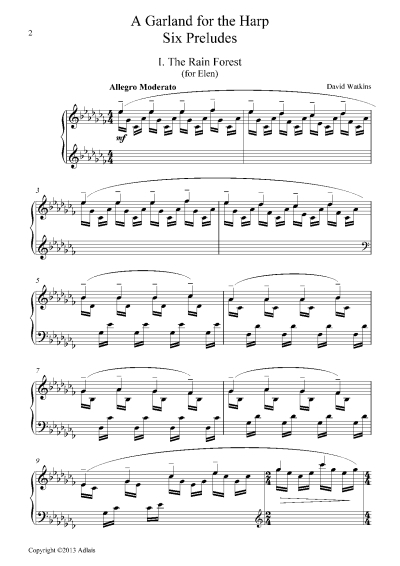 This Suite of short and contrasted preludes can be performed consecutively or separately. These pieces can also be used as useful studies of medium difficulty. 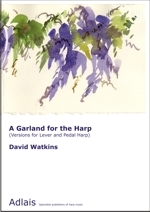 The score contains separate versions for Pedal Harp and Lever Harp as well as suggestions for division to enable performance by a Harp Ensemble. This prelude evokes the continuous watery mist sparkling gently under the green canopy of the Rain Forest. Written to encourage a young harpist, the filagree nature of the harp writing looks complex but is in fact very easy to play and memorise. These simple fragments, when linked together, imitate the flights of birds. A short essay in sonority which captures the sound of pealing bells with all their attendant overtones. A playful study with contrasting rhythms. An ancient mode used to conjure up timeless feelings of sadness. Fragments of rhythms lead into a middle section which develops into a 'rumba' with ongoing rhythmic contrasts.